When Android 7.1 Developer Preview came out over a week ago, it brought App Shortcuts which are basically shortcuts for various actions included in the app that can be put on your homescreen for easy access. Since then, several third-party apps have already been updated to support the latest system features. Twitter for Android is the most notable, with shortcuts and a circular app icon already in testing on the latest alpha build. 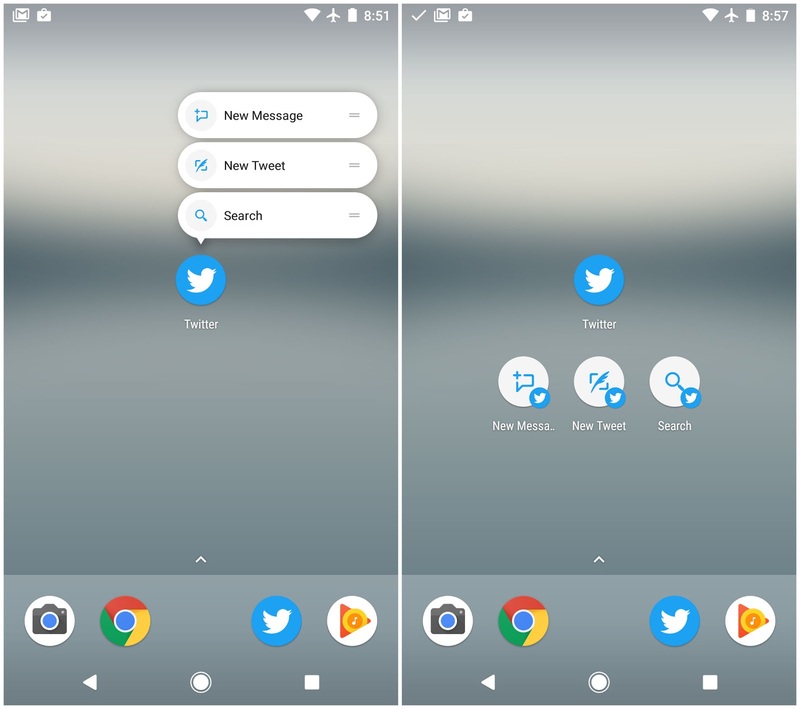 If you have Google's Pixel or running latest Developer Preview, you can tap and hold on Twitter app from the homescreen or app drawer reveals three shortcuts: New Message, New Tweet, and Search. The first opens up a pane that allows you to select accounts to start a new DM thread, while the second opens up the usual compose screen. Search is not the most obvious candidate for a shortcut and one that immediately takes users to the Notifications stream might be more useful. Also the icon has been changed for Pixel and Pixel XL, from a square to a rounded icon.This update also adds support for Nougat’s split-screen mode. The alpha build is stable and usable but has few bugs and rare crashes compared to beta or the regular one. Additionally, there is a persistent bug reporter in the notification drawer whenever the app is in the foreground which you can disable but it will also disable all the notifications from Twitter app.